Everybody has had a job where the break room was avoided. These rooms, filled with old, cast-off furniture, a refrigerator filled with items that may have been food but now look like a science experiment, give an overall unclean, unwelcome feeling. Consider buying some new break room furniture to make the room more inviting. Giving your lounge room a face-lift will not only make employees feel respected and honored, it may make them more productive. According to the National Safety Council, 83% of people choose to forego the breakroom and eat in their workspace. However, a desk has 400 times more bacteria than a toilet seat. By making your break room a welcome environment, employees may be sick less, and will get more work done. In your room, consider the space and choose tables that will fit well. Cafe tables are an excellent choice because employees can gather in small groups and converse on their down time, and it gives the room a warm, welcoming touch. If your room has to seat a lot of people in a limited space, or the tables need to be removed at times for an alternate purpose, consider folding tables. While nothing fancy, most employees will appreciate a nice clean surface to eat their lunch. If you are choosing cafe tables, consider choosing restaurant chairs that will give a consistent look. These will provide the atmosphere that enable employees to feel like they are at a nice cafe, even if they are eating a sandwich from home. Other options include chairs that stack, and different materials that make cleaning them fast and easy. When people come to work, they want to have a safe place to store their personal belongings. If you have room, install some pleasant looking lockers into the break room so employees have the option to lock things up and not be concerned with them as they get their work done. The office break room doesn’t have to be avoided. With a coat of paint, some new break room furniture, and a refrigerator clean-out, the space can be a welcoming area that employees will want to use. 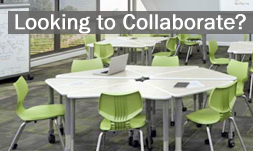 For more office school lounge and break room furniture ideas, contact us. Interesting article on office break room furniture! If the furniture in the break room is more appealing, more people are likely to eat there and actually make use of the room. Employees will be encouraged to eat and rest there and not have to leave the office during their breaks.